4th generation, lifelong farmer - early adopter of organic practices in the late 60's - utilize regenerative practices on 23 acres in the high savannah of Baja Arizoma. Live in a cob house. Farm is 100% solar powered. Currently have Nubian dairy goats, Turken chickens, American Guinea hogs, alpacas. Utilize rainwater harvesting extensively. The more diverse the mix of plants is the more carbon that will be sequestered in the soil and the more diverse the mix of soil microbes will be. More carbon and microbes greatly increases overall fertility. Increased fertility means increased livestock production as well as increased nutritional levels in the products from said livestock. After all, its ultimately all about nutrition. Much of what permaculture is about is finding ways to cooperate with nature instead of viewing it as something to be conquered with technology and machinery. Imposing machinery into this scenario will result in an infestation of weeds which will take many years to recover from. As a fourth generation farmer I can tell you that all of the comments about using goats to bring the invasive woody perennials on your place under control is very good advice. Ripping the roots of those perennials out with machinery will destroy many years of nature working hard on your behalf to sequester carbon deep into your soil. As the goats turn the woody perennials into fertilizer for you, the plants will slowly begin to die off and the roots will begin to decompose and in doing so will provide very nice channels for rain water to penetrate deep into your soil. And your talking about ripping all that out? Why would you want to fork out money to destroy a good thing when you can turn what you have into money in the form of meat or dairy on the hoof? Sorry for being blunt, I come from a long line of very practical farmers. I'm going to go against the grain of most comments here and say bamboo is your best choice. Which one should I choose for my new kitchen? If you' were interested in doing something sustainable then you might want to consider earthen/clay counter tops. I've done several, with bamboo as a substrate. The rough willow branches will cause the plastic to tear sooner rather than later - more fodder for the landfill. Might want to consider just growing the right crop at the right time, as our forefathers did sustainably for countless millennia. Thomas - One of the laws of thermodynamicss is that heat always moves toward cold. The heat generated during the day will be absorbed by the cold of the thermal mass. When the sun goes down the precess is reversed and the heat stored in the mass then moves back out into the cooler air of the greenhouse, helping to mediate the temperature. 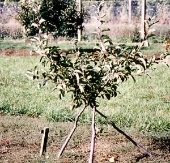 All of the trees that Johnny Appleseed planted throughout the Ohio River Valley were from seed. Those trees had the highly valuable random genetics your referring to. Since then we've done nothing but select for ever sweeter and larger fruit. In the process, nutrition has gone by the way side. I've seen the term "spitters" used several times in this thread. Too bad. Those spitters are often the most nutritious apples. With diabetes and obesity running rampant (due to deriving ever more calories from carbs (sugars)), we would do well to eat more spitters and fewer of the sickly (literally) sweet apples found in most stores today. Besides, planting from seed leverages genetics much more powerfully to develop land races and cultivars than planting the same old root stocks and waiting for hundreds of years for that root stock to hopefully acclimate to the soil and climate conditions of any given local. Judging by the look of the vegetation around the home it appears that the soil there is somewhat acidic. If you were to use the water to irrigate, the alkalinity that the rain water picks up from the roof will be largely neutralized in the soil. If you live in an area with soil that's already alkaline, your soil could become so alkaline that crops may perform poorly. If the water is used for drinking and bathing you might see a chalky development in your skin and hair that becomes more unruly. Could lead to kidney stones as well, unless you take dietary steps to avoid these things.